Yesterday after work I stopped into Troy's shop to ask him what I was doing wrong with the front springs. He said, "Why don't I just stop over there after work, and we can take a look?" I said that would be great! After Sara got home we started working on tightening the fuel line clamps we had installed on Monday, but did not get very far before Troy showed up. 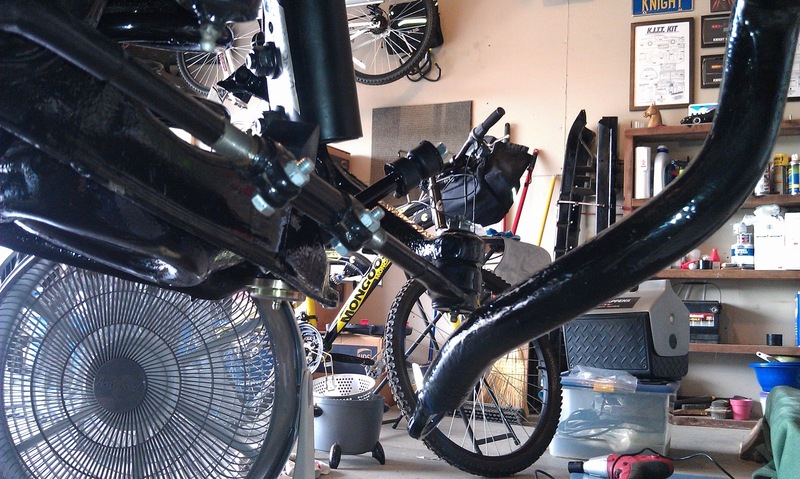 Troy started installing the spring in the same manner I had and quickly found out that it just wasn't going to work. I wasn't happy, but I sure was relieved to find out it wasn't just me. Without the engine and transmission in the car there is no way to compress the spring far enough to allow it to swing into place with the A-arm. We ended up having to remove the A-arm and then with the spring in place, jack the A-arm to the point that it would just start to lift the car. Sara was chosen to stand on the K-member to help add a little weight to the car. 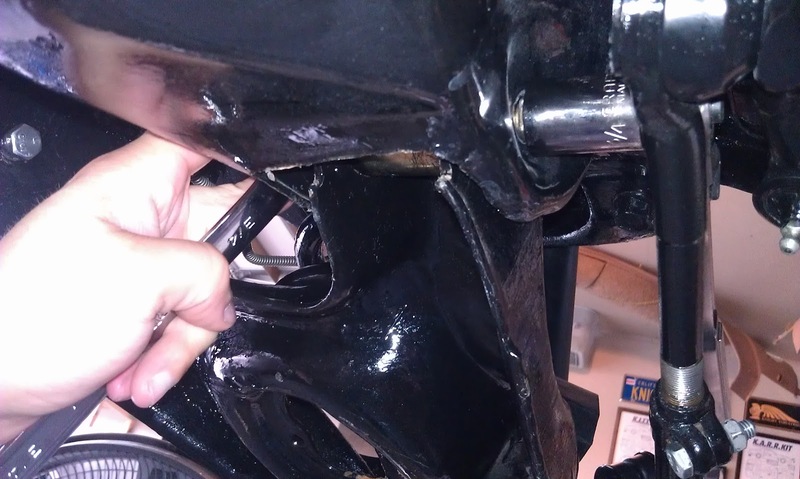 Then we used the spring compressor and impact driver to compress the spring enough that we could reattach the A-arm. 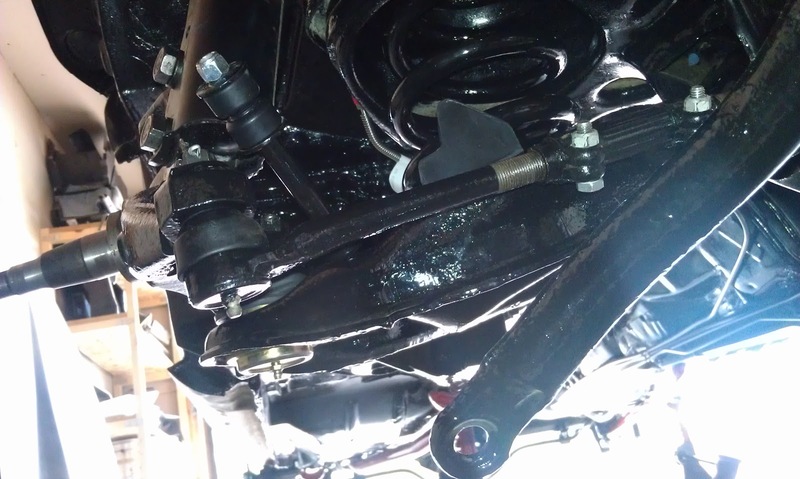 With the A-arm attached, we moved the jack to the outer edge by the ball joint and jacked it up enough to install the front strut. We had to repeat this procedure for the passenger side. It took about two hours to install both springs and struts. There is absolutely NO WAY I could have done this without Troy and Sara's help. It was definitely a three person job. Sara was quite the trooper standing on the K-member for over an hour! Thanks Troy and Sara! Sara (and later her Dad) took so many pictures during the install that I decided it would be better to just put them all together. 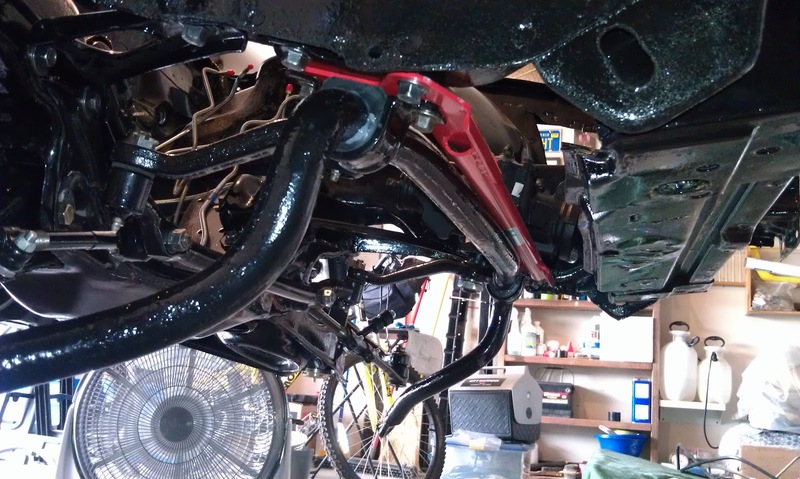 Here is a video illustrating the process we went through to install KITT's front springs and struts. 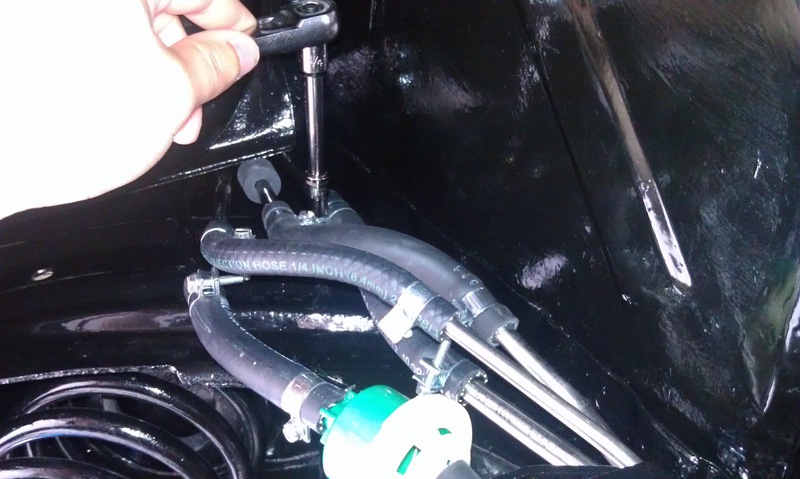 Today after work I finished tightening all the clamps on the fuel lines. We just put the bolts through the A-arms and turned the nuts on the ends last night, so I tightened up the bolts on both A-arms. 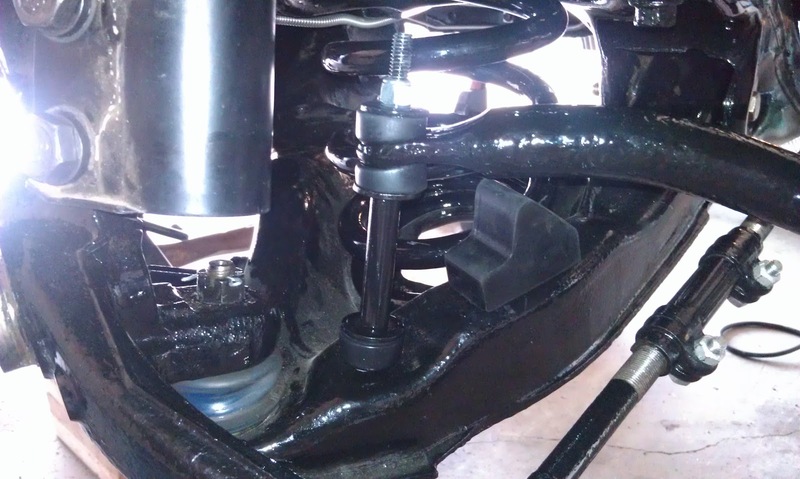 One of the other side effects of the way we had to install the A-arms was that the sway bar needs to be removed and re-positioned above the now-secured A-arm. There just is not enough clearance to swing it up and into place without removing it. 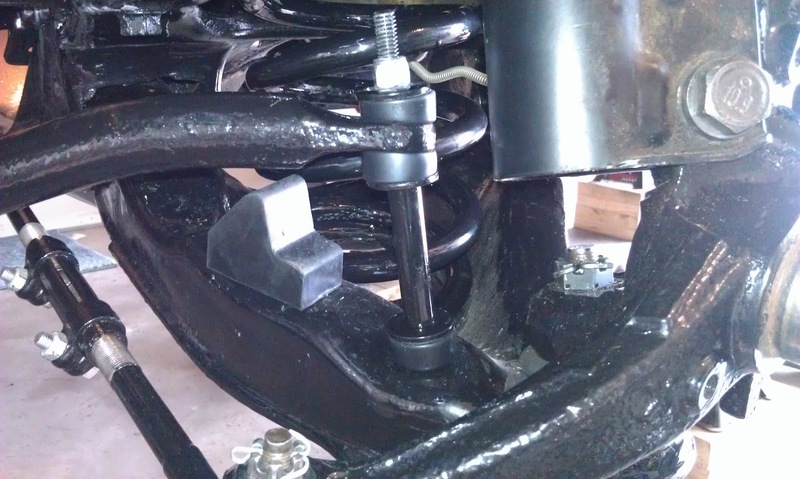 I removed all four bolts and re-positioned the sway bar and then bolted it back into place. Here it is after the adjustment. 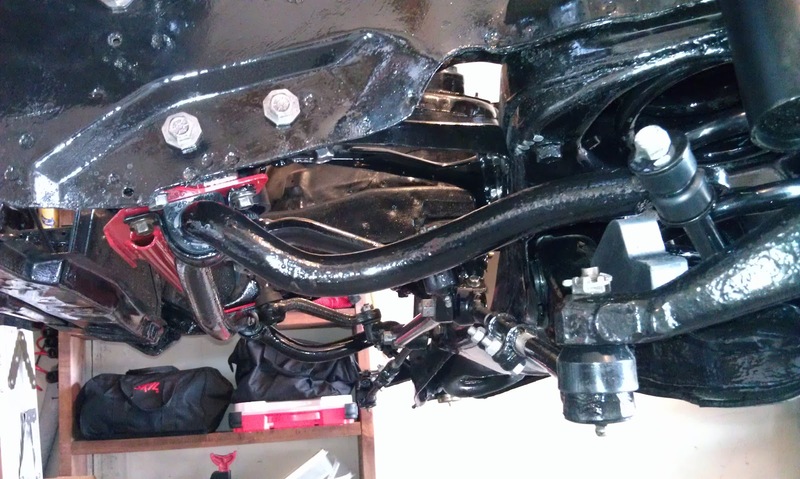 Then I installed both the driver and passenger end links. KITT's Nose And Stone Guards Are Here! "Why Are You Standing On The Car Like That?" "I Am Not A Mechanic!"